Lawrenceburg City Hall is located at 25 Public Square, Lawrenceburg, TN 38464; phone: 931-762-4459. Photo: Garrett House, ca. 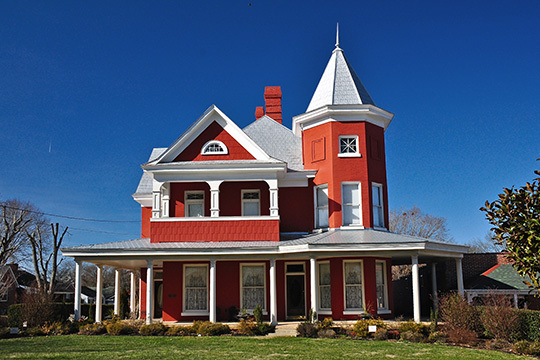 1895, 205 South Military Avenue, Lawrenceburg, TN. Listed on the National Register of Historic Places in 2009. Photographed by user:Skye Marthaler (own work), 2015, [cc-by-3.0 (creativecommons.org/licenses/by/3.0)], via Wikimedia Commons, accessed April, 2015. The city of Lawrenceburg is situated on a 400 acre tract of land which the North Carolina legislature granted to John Thompson on April 14, 1792. An act of the General Assembly of Tennessee, passed on November 23, 1819, later confirmed this initial land claim. When the new county's seven commissioners (including David Crockett) selected a seat of government in 1819, they chose Thompson's parcel, largely because it laid squarely on the route of the Military Road, an important federally-supported 516 mile long thoroughfare from Columbia to New Orleans. The land also stood only four miles southeast of the county's geographic center. The new town was arranged around a central square, two acres in area, being sixteen poles wide (east to west) and twenty poles long. (This makes the public square a rectangle, actually.) The four main streets branching from the square were each four rods, or 66 feet, wide. Streets and lot lines were run at magnetic variation of 13 degrees north, rather than oriented to true north. The four main streets were Pulaski (headed eastward), Waterloo (headed westward), and running north to south, North and South Military streets. At the center of the square, where the streets would meet, stood the county courthouse lot. The initial courthouse was a two-story brick courthouse that was first occupied in 1821. The square initially was divided into sixteen large lots, with those on the north and south sides having a frontage of 49 1/2 feet wide by 132 feet deep while those on the east and west sides were 66 feet wide and 99 feet in length. The lot arrangement currently found in the public square dates to the late nineteenth and early twentieth centuries when several of the initial large city lots were subdivided into smaller parcels to make way for new businesses and offices. Another factor spurring new development on the public square was the arrival of a railroad. The Columbia, Lawrenceburg, and Florence Railroad was chartered in 1879 and the railroad (now the Tennessee Southern) was constructed soon afterwards. The new transportation link ran just to the east of the east side of the public square, and bisected Pulaski Street. During the 1880s and 1890s, the railroad brought about a new wave of economic and industrial growth in Lawrenceburg. It also spurred the development of new architecturally stylish homes along Pulaski Street. C. Van West, Caneta Hawkings, Jennifer Martin and Richard Quin, Center for Historic Preservation, Lawrenceburg Commercial Historic District, Lawrence County, TN, nomination document, 1991, National Park Service, National Register of Historic Places, Washington, D.C.